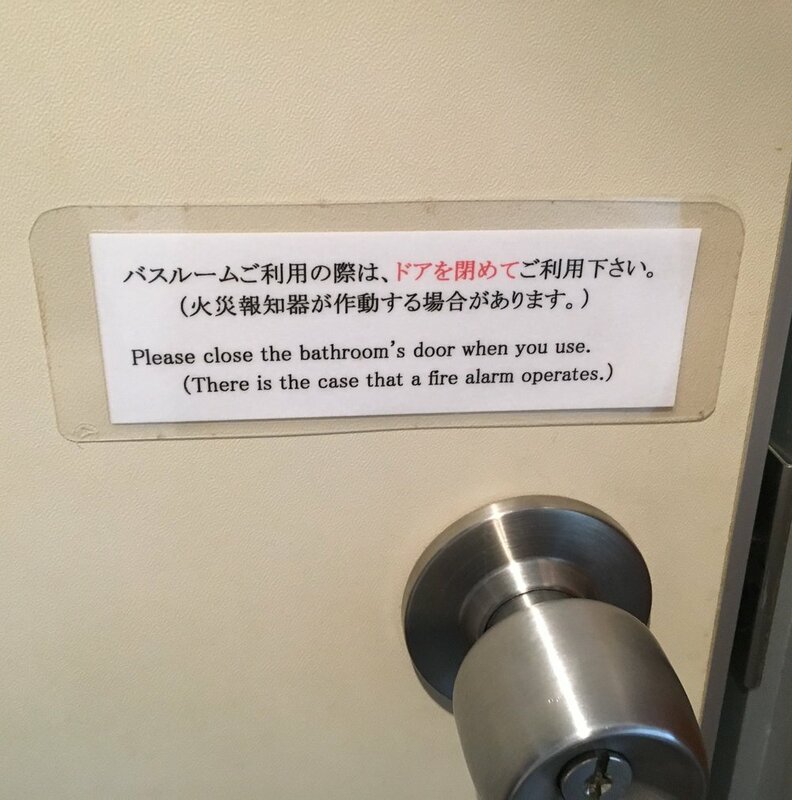 I found this in a bathroom in the Sendai train station. I was horrified to discover that all these years I needn't have been climbing onto the toilet seat. Oh yes. Trust me, as a person who hates public bathrooms I was fascinated by the bathrooms in Japan. There were some very specific things that made them far better than Western bathrooms and I'm going to tell you about them. Let's start with the basics. I have a real problem with the way that people don't knock on public bathroom doors. You're just in there, doing your private business when someone grabs the knob and shakes it violently. And, of course, you know that they won't believe that there really is someone in there and will attempt to open it at least twice more. I always think "KNOCK DAMN IT, KNOCK!" But then, if they do knock, one never knows what to say. You could go with the formal "occupied" or the brusk, "I'm in here". "Just a minute" works well, but then you might feel like they're timing you. Or, you can be completely creepy and say "come in..."
There is, of course, a simple solution to this, and in Japan they use it. This is the color-coded bathroom knob. It's a simple invention, one that we use in our most low tech toilet options (the porta-potty) but seem reluctant to use it in more high-class settings. If you don't know what I'm talking about, it is where when you turn the lock, a little opening in the knob outside turns to display a red dot and when you unlock it changes to green. This means that all someone has to do is look at the display to know whether or not someone is in there. I didn't see a single public bathroom in Japan that didn't have this simple design. I even saw it in one person's private home. Though there are a variety of soap dispenser styles in American bathrooms, the most popular seems to be the push lever gravity feed and the automatic squirter (I have no idea what the technical names are, can you tell?). For both of these, they tend to use the foaming soap. In Japan, pretty much every bathroom has a soap dispenser that has a small metal bead on the bottom. You push the bead up with your fingers, allowing the liquid soap to escape and pool in your hand. You can do this with a quick tap and get as much as you need. Actually, I've seen these in maybe one or two American bathrooms but they are rare. The reason I like it is that the only place you're touching on the dispenser is the part that the soap comes out of. This makes it seem far more sanitary. "But what about the automatic dispensers? You don't have to touch them at all". Yeah, but they don't always work smoothly, meaning you have to wave your hand around like an idiot. I'd rather just tap it. I may not be a mother but I have taken my niece out on the town enough times to now that having to pee while carrying around a baby or young toddler is a nightmare. Where are you supposed to set them down? It's not exactly easy to hold onto them while trying to pull your pants down, and you're certainly not going to set them on the floor. That's just gross. In Japan, they have come up with a simple solution. Baby seats in the bathroom stalls. It's so brilliant, I can't believe it isn't a thing everywhere. I live fairly close to Bar Harbor, which is a very popular destination for tourists in Maine. Personally, I try to avoid it in the summer months, when the traffic is terrible, parking spaces are sparse, and cruise ships send boatloads of passengers on shore for a little shopping and ice cream consumption. However, one day a friend of mine and I were hanging around Bar Harbor, waiting for her husband to get off work. I had to pee like a racehorse and decided to brave the single public bathroom hub in town, knowing perfectly well that it was likely to be disgusting. Boy, was I right. Every single toilet had urine all over the seats. And this was the women's section. I had to spend fifteen minutes cleaning up the toilet, while gagging and doing the pee-pee-dance, before I would sit down. I finally emerged, probably a delicate shade of green, and joined my friend. I told her about my harrowing experience and then said, "how do women even get pee on the seats?" She answered without a thought, "Oh, because obviously, you don't want to sit on the toilet, so you hover and pee." I blinked about a thousand times. Seriously? Clearly, other women are more coordinated than me. I would certainly get pee all over my leg if I tried that, or I would lose my balance and end up bashing my head off the toilet paper holder. So, what does this have to do with Japan? I mean, aside from the fact that most Japanese people would never leave a toilet seat with their pee on it. A lot of Japanese bathrooms have an option for a "traditional toilet", that is to say, one that is designed for people wearing kimono. In other words, you squat over it and relieve yourself, while holding up you kimono skirts. much easier than trying to hover over a western toilet. This is something I didn't even know bothered me until I went to Japan and didn't have to deal with it. Stepping out of the shower on my first morning, I was amazed to see my own reflection in the mirror, despite the fact that the tiny room was full of steam. Upon closer examination I discovered that the mirror was actually heated, preventing the condensation from clouding the glass. This meant that I could do my hair and apply my makeup without having to wait for the steam to disperse. It's a small thing, but aren't those the things in life that make a difference? In each of my hotel rooms, the bathrooms were very small. Well, the rooms, in general, were small but especially the bathrooms. And yet, they still manage to have nicer bathtubs than literally any I have ever seen in America. As a tall person, I am all too familiar with the eternal struggle of a so-called "relaxing bath". Sit up and soak your legs while your top half freezes, or lay back and stare at your uncovered knees while your legs come over with goosebumps? In Japan, they have solved this problem by simply raising the sides of the tub allowing you to be completely covered by the water. But, you don't need to feel like you're wasting water, as the tub is shorter. It means that you have to sit upright more than you might be used to, but who cares? You'll actually be soaking instead of freezing! Even though It was super hot when I was in Japan I still took the opportunity to try this miracle tub. I still dream about it. Another thing I thought was nifty about the tub was that it actually shared a faucet with the sink. That's right, one knob for the sink, tub, and shower. All you had to do was swing the faucet to the right side for whichever water need you had. Only once did I accidentally spray the bathroom with the showerhead. Okay, I know that some people are going to think this is crazy, taking into consideration most American's attitude about bidets. However, I'm guessing those people who most vehimently speak against bidets also haven't used one before. After all, they're very rare in the US. 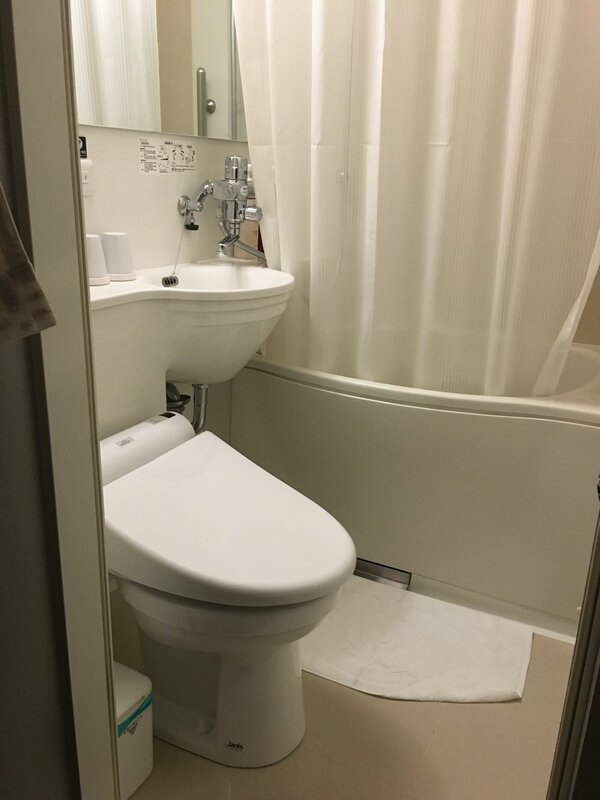 I myself had never come across one before I went to Japan, where pretty much every (non-traditional) toilet is equipt with one. Unlike in France, these bidets are attached to the toilet itself, so you don't have to stand up and crab-walk over to the bidet. They are also electronic and have more fuctions than just the water jet. Now, it is a little intimidating to see mysterious buttons on the side of your toilet seat, especially with kanji instructions. However, if you simply calm down you will see English words too and pictures! Easy as pie. The buttons are for whether you want to spray your back bottom or your front bottom (if you're lucky enough to have a front bottom). They also have pressure and temperature adjusters so that you can spray to preference. Some even have a "flushing sound" volume, which I'm guessing is helpful for people who hate for others to know they were using the toilet at all. There is also occationally a "Powerful Deoterizer" which I'll admit I wasn't brave enough to try. Without getting too much into the gritty details, I think that every toilet should have this options. But, it is especially nice in the hot summer months. I'll let you imagine why that would be. But, if you're really against using a bidet, don't cancel your trip to Japan, they do have toilet paper as well. 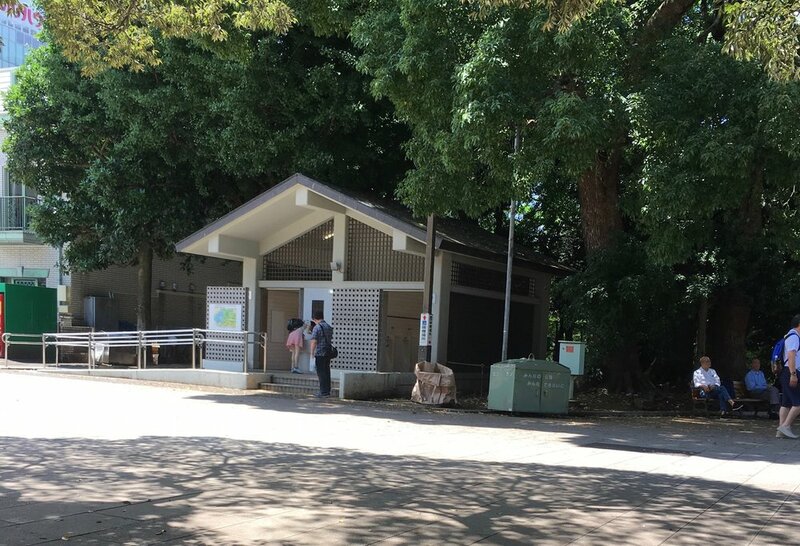 A public bathroom in Ueno, where you can clearly see directly into the men's side. Ummm, I should not be able to see a urinal from out here. Anyway, this ends my lecture on Japanese bathrooms. I hope you enjoyed it. For more reading like this, you could try this post, where I talk about Japan's strange facination with poop.